Sounds like it's still going to be a little while off, since they can't yet get performance to an acceptable level. 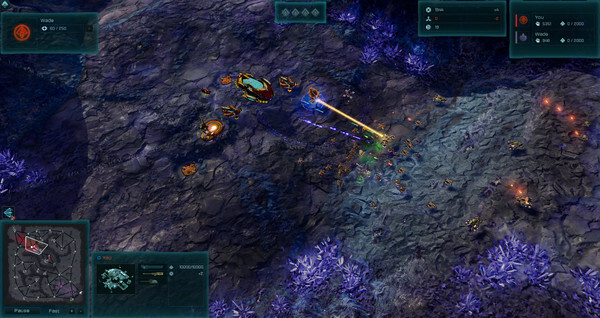 Hopefully before the end of the year though, would be nice to have another massive-scale RTS supported on Linux. They also mentioned that they're doing a new game set in the Ashes universe. On top of that, they're doing a sequel they say "if you liked SupCom or TA then you will really like where we want to take the sequel". Hopefully those two new titles will also come to Linux, once they get the engine performance issues sorted. I was hearing that about Vulkan last time from them, but I've not seen any mention about what in Vulkan is causing them problems. Drivers, shaders (HLSL to SPIR-V toolchain), or maybe it's just their own experience with Vulkan. Not that such detail is to be expected in general statements on Steam I suppose (as much as that would be nice for people like me, I do get that it's of limited value to most of their target audience), but I do hope they're communicating with Khronos about it so that the issues may be addressed. Good to hear that the engine is still getting the work. I stopped expecting Ashes long ago (and I got it with my graphics card as a promotion anyway), but hopefully this work can go into future games. The game already supports Vulkan on Windows and runs fine there. What are they having issues with? Where are their bugs filed to Mesa? If they are having Vulkan issues (rather than engine issues), they should file bugs, how would anyone know about that otherwise to address them? It is good to see Stardock supporting linux and hopefully this will be the first of many. This is much better then the trend of others that are only "supporting" SteamPlay. Shmerl Where are their bugs filed to Mesa? If they are having Vulkan issues (rather than engine issues), they should file bugs, how would anyone know about that otherwise to address them? I agree, it would be great if Stardock would cooperate with the Mesa developers, and join forces to benchmark both Mesa and the engine, to find the bottlenecks and improve on them. It would probably be a good idea to do this sooner than later, long before the game is in a "finished state", to decrease the cost for the Stardock developers to port the game to Linux.